On this page are sample plots from seven different compounds, all of which are thought to contain room temperature superconductors. They all produced sharp diamagnetic, resistive and/or specific heat changes during earlier testing. 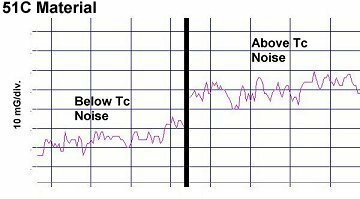 A visible reduction in background noise has been found below Tc in all of them. 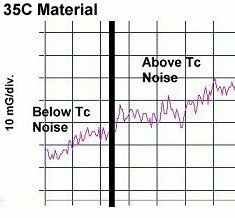 Thermal noise (also known as Johnson or Nyquist noise) is a product of lattice vibrations (phonons) and is directly proportional to temperature. 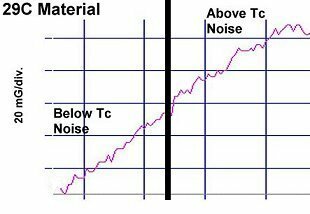 So, as a material is slowly cooled, its thermal noise level slowly drops. 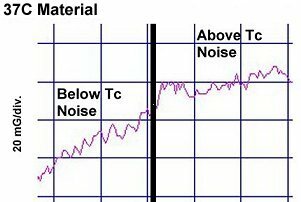 In each of the plots on this page, however, the drop in thermal noise is not gradual, but sudden and sizable. Most plots visually show a 20% to 40% reduction below Tc. Since the volume fraction of the superconductive phase is only around 0.1% of the bulk, this means the correlation is 200 to 400 times as great as the VF. This is likely due to the "proximity effect", where nearby non-superconducting molecules take on superconductive properties. In this case those properties include a coherency of lattice vibrations that suppresses random vibrations. Since the proximity effect typically extends outward hundreds of Angstroms,2 a single superconductive unit cell can easily affect an equivalent volume 200 to 400 times as great. 1. While not every plot displayed a reduction in noise below Tc, every material did. 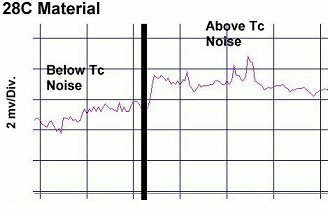 Thermal noise either held constant or dropped in amplitude in every instance. There is no phenomenon in the physical sciences - other than superconductivity - that can explain such a drop.